The Utah Jazz are in a battle for a top-four seed in the Western Conference and the next five games could solidify home-court advantage in the playoffs. With their 120-95 win over the Atlanta Hawks, the Utah Jazz kicked off what might be a hugely important string of games leading into the All-Star break. Perhaps hung over from prematurely celebrating a Super Bowl victory, the Hawks were barely in this game with the 54-50 halftime scoreline flattering at best. Gordon Hayward scored 30 points and Derrick Favors — whose recent lack of production started to raise questions — added 20 points and 10 rebounds. As the slowest-paced team in the NBA, the Jazz managed to produce their second-best offensive rating of the season against the Hawks and kick-start a three-game road trip before three more at home before the All-Star break. Now two games ahead of the Los Angeles Clippers for the fourth spot in the West, the Jazz have the plateauing Houston Rockets in their sights just three games ahead. The Rockets have gone 5-5 in their last 10 games, but have a favorable schedule leading into the break playing four teams well below .500 (Orlando, Charlotte, Phoenix, and Miami). Assuming the Rockets at worst go 3-1 in this stretch, it’s important the Jazz keep the pressure on. Visiting the New Orleans Pelicans on Wednesday is no walkover. And despite their slow start to the season, facing the Dallas Mavericks on a back-to-back the following night makes things even more difficult. These are teams the Jazz should beat and if they are going to justify their third or fourth position in the West; they must go back to Salt Lake City with at least a 2-1 record on this trip. Having momentum returning home is paramount given the opposition they face at home before the break. The Boston Celtics are on fire and are the opponent for the first of three games at home before nine days rest. That game might be a coin flip, but equally, a potential opportunity to announce to the league they need to “take note” of the Jazz. Beating a surging Celtics team that will quite possibly be riding a nine-game winning streak into Energy Solutions Arena will give the Jazz the recognition they deserve. Not only that, it puts them in a great position to extend their lead over the visiting Clippers two nights later before facing the Portland Trail Blazers to round out the pre-All-Star portion of the season. It’s not unfathomable the Jazz go 5-0 over the next five games and enter the break with a 38-19 record. In saying that, 3-2 or even 2-3 isn’t out of the question. These are all decent enough teams playing an often underrated Jazz team they will all think they can beat. Playoff seeding will already be on the mind of Quin Snyder with home-court advantage the ultimate goal. The difference between third and fourth isn’t overly important, but dropping back down to fifth and potentially playing four road games in the first round of the playoffs changes the landscape of the postseason. The league has its top-tier teams who are all but assured of a conference finals spot, but that is no reason for the rest of the league to take a back seat. A strong playoff performance or even an unexpected appearance in the conference finals will put this Jazz team in a different light. With a strong postseason showing, they can escape the shadows of the Golden State Warriors and San Antonio Spurs and cast their own over a conference constantly chasing the elitist top tier. For the Jazz, gaining that reputation starts now with these five games. 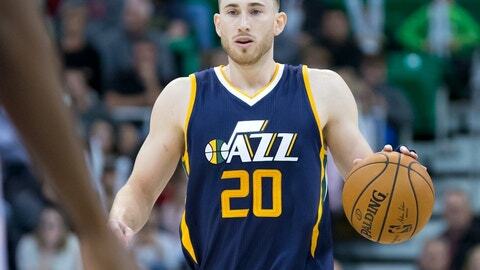 Happiness is a function of expectation and for years the Jazz have seemingly stopped short. The team is now where the fans expected them to be so it’s important they remain steady a sew up a top-four seed in the West this season before moving on to bigger and brighter things.